Lake of Bays, is a large lake that does not interconnect with any other lake. Some people consider Lake of Bays a little less busy than the other large lakes although there is still plenty to see and do. Just touching the southernmost part of Muskoka is the Trent-Severn Waterway Park System. This waterway is a major recreational boating park that links a number of lakes and rivers with a series of 125 locks. It extends for approximately 386km, through Central Ontario and links the Bay of Quinte (Lake Ontario) to Georgian Bay. In Muskoka, Lakes Couchiching, Sparrow, the Severn River and Gloucester Pool (at Port Severn) are part of this system. Vacation home rental rates on these "large lakes", due to demand, are higher in price. All other lakes are considered "smaller", or "small lakes". Of course, each individual lake could vary considerably in size. See the Surface Area column in the following table for general comparison purposes. It is important to note when planning your Muskoka cottage vacation that ALL Muskoka lakes, large and small, encompass the scenic nature beauty that Muskoka is famous for. While cottages for rent on the big Muskoka lakes and lake systems tend to be more popular, renting a cottage on a smaller Muskoka lake has its advantages. Often the smaller lakes are quieter and have less boat traffic. If you prefer canoeing and kayaking to fast motor boats, renting on a smaller lake may be the better option for you. And, of course, cottages on the smaller lakes tend to be priced lower than those on the larger lakes. NOTE Information in this table has been compiled from data provided by the Ministry of Natural Resources. If you require additional specific information on a particular lake, including the type of fish in each lake, please call them directly at the Regional office (Huntsville) (705) 789-9611, or, the local District Office(s): for Gravenhurst/Bracebridge area call (705) 645-8747, for Huntsville area call (705) 789-0117. As many lakes have the same name, be sure you have the correct location. Incorporated in January 1991, Vacation Time Real Estate Inc. is Muskoka's only Real Estate brokerage that specializes exclusively in privately owned vacation home and cottage rentals in Muskoka! If you own a cottage or vacation property in Muskoka, or, are just looking to rent one, you have come to the right place. We live, work and know Muskoka, Ontario. We have the expertise, professionalism and knowledge to assist both cottage owners and renters in their mutual goal of satisfactory, trouble-free cottage rentals. Over the last decade we have listed for rent over six hundred Muskoka cottages and successfully arranged more than seventeen hundred cottage rentals. This has resulted in a loyal and dedicated client and customer base that trust our judgment, honesty and integrity. You can place your faith in us that we always strive to serve our clients and customers to the very best of our ability. We want your cottage rental business and are willing to work for it. Vacation Time Real Estate Inc. views all of their cottages and only accepts cottages that meet their high standards. When searching for a cottage, we are there to help with the search so that you can choose the cottage most suitable for your family vacation in Muskoka. Our goal is not just to rent a cottage but to match up a renter with the best possible cottage for them. On our site, searching for a cottage is not that difficult. You can search by time period, or by a specific cottage or lake. We strive to match a cottage owner with the appropriate renter and never rent a cottage without the owner's approval. We look after the rental application, the rental agreements between all parties and offer Privacy Act protection for both the cottage owner and renter. As well, we are available to provide rental evaluations for both the cottage owner and prospective owners. For those looking to purchase a cottage in Muskoka, we are available and qualified to refer you to a Real Estate (Sales) Brokerage or even handle the complete Offer to Purchase. We have rental brochures in tourism booths and Real Estate brokerages thoughout Ontario, the U.S. and Europe. They will give you an insight to our services and tell you how to prepare your cottage for rental. Whether you are looking to rent a Muskoka cottage or you wish to rent out your Muskoka cottage, Vacation Time Real Estate has the expertise, experience and resources to make your cottage rental experience with us pleasant and worry free. Over the years, our Muskoka Ontario cottage rental company has helped thousands of cottage renters find the ideal Ontario cottage for their vacation in cottage country. We have also assisted hundreds cottage owners to effectively offer their cottages for rent and help them to attract quality renters and earn a great rental income. You will find that some cottages do not have any dates yet. Please keep watching our site as the dates do come in later. Some cottage rentals are for monthly rental or more but if they do not rent for that period of time, they will change their availability to a shorter term such as weekly rental or bi-weekly rental. New cottages and availability are added to our web site most every day. Cottage rental rates vary from lake to lake. You will find that cottages on the larger Muskoka lakes such as Lake Muskoka, Lake Rosseau, Lake Joseph and Lake of Bays are higher than cottages on the smaller Muskoka lakes. The Muskoka area is one of the most popular vacation areas in Ontario. It is known for its granite rock shores, pine trees and wildlife. Numerous historic Muskoka resorts offer fine dining. Muskoka is well known for its spectacular golf courses. It is truly an area for all activities from swimming, horseback riding, boating and snowmobiling. Muskoka Ontario is famous for its many beautiful lakes, and no wonder. This very popular Ontario vacation destination area boasts more than 900 individual lakes. Muskoka’s four largest and best known lakes, Lake of Bays, Lake Rosseau, Lake Joseph and Lake Muskoka, when combined, account for over 30% of the total lake surface in the region. The several hundred small and medium size Muskoka lakes that make up the other 70% are every bit as beautiful as the "Big Four". Vacation Time Real Estate has a wide selection of cottage rental properties on many of the best Muskoka lakes, big and small. We will help you find the ideal Muskoka rental cottage for your cottage country vacation in Muskoka. Gravenhurst is the first major town that you come to when you enter the Muskoka Lakes Region. It offers dining, shopping, live theatre and scenic boat cruises on Lake Muskoka and Lake Rosseau. If you travel around Lake Muskoka, you will come to the Town of Bala where there is a lovely waterfall, a popular bakery and museum. Port Carling is the next town and an area where you may see some famous people and movie stars that own cottages in Muskoka. Bracebridge is located at the northern part of Lake Muskoka and has a movie theatre, boat cruises and great waterfalls. For those who want to enjoy the Huntsville area, this town offers a lookout, pioneer village and lots of shopping. Lake Of Bays, Fairy, Mary, Peninsula and Lake Vernon are all in this beautiful area and offer many cottage rentals for you to enjoy! 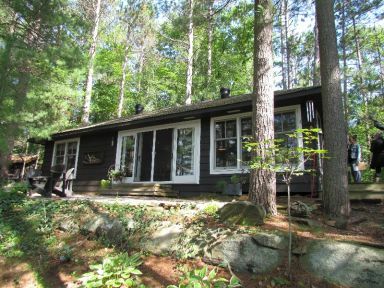 To aid in your Muskoka cottage rental search, there is a full description of each Muskoka cottage for rent, a rate page, and an availability page. Fifteen colored photos are available on our site as well as a short movie clip and aerial photo. A video is available for each cottage and can be viewed at our Muskoka cottage rental office or mailed out (usually free of charge). Vacation Time Real Estate Inc. is available to help with your search for that "perfect" vacation cottage. Just give us a call or send us an e-mail. We look after all of your rental needs from the rental application and agreements, handling of money ( in our Trust account), key pick-up and any problems or concerns (if any) during the rental period. Vacation Time Estate Inc. is also qualified to provide cottage owners and prospective owners with " rental " evaluations. Although, Vacation Time Estate Inc. does specialize in rentals, we are also qualified to help our renters and owners with the purchase and sale of their cottages. With just over 50,000 permanent residents, joined in the summer by 100,000 plus more seasonal property owners, Muskoka is a major Ontario cottage country summer colony. Many Muskoka cottages have been passed down through families from generation to generation. While Muskoka has both seasonal family cottages and year round family cottages, Muskoka is also known for its large mansion-like summer homes, both year round residences and seasonal summer estates. Lake Rosseau, Lake Muskoka and Lake Joseph, Muskoka’s three major lakes are where you will find the most expensive cottage properties, but there are also many more modest and economical cottages on these lakes as well. Over the past few years, many celebrities and Hollywood star have built vacation homes in Muskoka. So many, in fact, that the New York Times has nick-named Muskoka "Malibu North". Don’t be surprised if you bump into Goldie Hawn, Kurt Russell, Tom Hanks, Steven Spielberg or Cindy Crawford, while picking up some groceries in Rosseau or Bracebridge. In Muskoka you will find many interesting things to see and do. In addition to the wealth of outdoor recreational activities in Muskoka, Muskoka visitors will find many other exciting attractions and activities, including provincial parks, golf, live theatre, museums and historic sites, antique and craft shops, ski hills, horseback riding, theme parks, festivals & fairs, boat cruises, Las Vegas style gambling at Casino Rama, and fabulous shopping opportunities and fine dining in the towns and villages of Muskoka and area, including Rosseau, Bala, Bracebridge, Huntsville, Gravenhurst, Orillia, Barrie, Midland, Penetanguishene and Port Carling. Visitors from outside Ontario will be happy to discover that all the exciting attractions that the city of Toronto has to offer are less than 2 hours away from Muskoka. During your Muskoka vacation, whether you are an avid golfer or a rank beginner, you will want to try out at least one of Muskoka’s many great golf courses. The Muskoka region is renowned as one of the most popular golfing destinations in Canada. Offering an amazing assortment of golf clubs and courses, there is a Muskoka golf course to challenge all skill levels and to suit all budgets. Here, along with many par-3 courses and 9 hole executive golf clubs, driving ranges and mini-putts, you will discover more than 30 championship courses, designed by some of the greatest golf architects in the business, including The Rock Golf Club, designed by Nick Faldo, the Grandview course, designed by Mark O’Meara, and Taboo, the home course of Canadian golf champion Mike Weir. 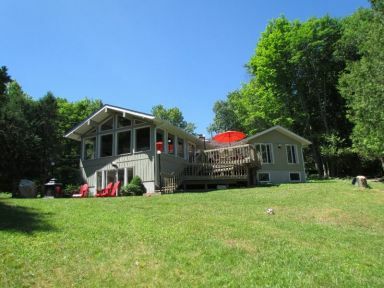 Some of the finest Ontario vacation rental properties available are here in the district of Muskoka. An extensive and diverse area, the Muskoka District is made up of several distinctive regions. For convenience, Muskoka real estate can be divided into five main areas - the Muskoka Lakes, the Huntsville and the North Muskoka area, Dorset and the Lake of Bays, the Bracebridge, and the Gravenhurst area. Vacation Time Real Estate has a wide selection of cottage rental listings in every part of Muskoka and we are always happy to share our extensive knowledge of the area to help you to decide where to cottage in Muskoka. To view all of our beautiful Muskoka lakefront cottages for rent, you have three options. You can search Muskoka rental properties by date, by specific property detail and location, or you can view rental properties by a specific lake. We are a licensed Real Estate Brokerage in the Province of Ontario. As such, we are accountable for our actions to the Real Estate Council of Ontario (RECO). Also, as a licensed Realtor we subscribe to the Canadian Real Estate Association's Code of Ethics and Standards of Business Practice. Vacation Time Real Estate Inc. is a member of the Muskoka Real Estate Board, Ontario Real Estate Association (OREA), the Canadian Real Estate Association (CREA), the Gravenhurst, Bracebridge, Huntsville/Lake of Bays and West Muskoka Chambers of Commerce and the Muskoka Lakes Association. We feel that to properly service our cottage rental listings, it is important that we only accept properties located within a one hour drive of our Gravenhurst office. This area includes all of the District of Muskoka as well as parts of the neighbouring districts of Parry Sound and Haliburton. Thinking of an Ontario cottage vacation? Look no further than our Muskoka cottage rental directory for everything you need to know. Here you can search from dozens of great private homes and cottages and cottages for rent. Cottages rental information is constantly updated and Vacation Time Real Estate has categorized available vacation rental properties so that potential renters can quickly match their requirements to the vacation property rental that best fulfills their needs. Ontario cottage country is the perfect destination to enjoy a cottage getaway. Let us help you find the perfect private cottage for your next vacation in the Muskokas. Nowhere in the world can you experience a holiday by the lake the way you can in Muskoka, Ontario’s oldest and most preferred cottage country destination. A Muskoka cottage rental vacation has so much to offer, for both vacationers from Ontario, and visitors to Ontario from across Canada, the United States and abroad. For visitors from outside the province, Muskoka, Ontario is the ideal vacation destination. Less than two hours from Toronto, Muskoka offers spectacular scenery and plenty of things to see and do. Vacation Time Real Estate has dozens of quality cottage rental properties available throughout Muskoka. You have come to the right place to find out everything you need to know about renting a great private cottage in Muskoka. The District of Muskoka consists of six municipalities, including the towns of Gravenhurst, Huntsville and Bracebridge, the Township of Georgian Bay, the Township of Lake of Bays and the Township of Muskoka Lakes. The Township of Muskoka Lakes has a year round population of less than ten thousand, but its population expands many times over with the arrival of summer cottagers and tourists. The three best known and largest Muskoka cottage lakes; Muskoka Lakes, Rosseau, Lake Joseph and Lake Muskoka, are located in the Township of Muskoka Lakes, where you will also find many interesting communities, towns, villages, hamlets and ghost towns like Bala, Bardsville, Barlochan, Beaumaris, Baysville, Bear Cave, Beatrice, Bent River, Cedar Village, Dee Bank, Dixon’s Corners, Dudley, Duffy, Echo Beach, Ferndale, Foot’s Bay, Glen Orchard, Gregory, Gull Rock, Hekkla, Juddhaven, Mendora, Milford Bay, Minett, Morinus, Mortimers Point, Park Beach, Port Carling, Port Keewaydin, Port Sandfield, Raymond, Redwood, Roderick, Rossclair, Rosseau Falls, Rostrevor, Shannon Hall, Sunset Beach, Thorel House, Tomelin Bluffs, Torrance, Ufford, Ullswater, Valley Green Beach, Walker’s Point, Willow Beach, Whiteside, Windermere, Woodington, Woodward Station and Ziska. Gravenhurst is located at the southern edge of Muskoka and is known at the "Gateway to Muskoka". It is approximately a two hour drive from downtown Toronto. Therefore, most vacation properties can be reached in less than a three hour drive from downtown. The town of Gravenhurst, Ontario encompasses a large area of the District of Muskoka. This Ontario cottage country town borders two lakes; Lake Muskoka, one of Muskoka’s largest and most prestigious lakes, and Gull Lake, a very popular cottage lake. Kashe Lake, yet another well-known Muskoka cottaging lake, is just 10 kilometres from the centre of town. The town of Gravenhurst has many popular tourist attractions for area visitors, including the Bethune Memorial House and Visitors Centre, and the Gravenhurst Opera House. The town’s most sensational attraction is the Muskoka Wharf, an 89 acre waterfront development of shops, services, accommodations and attractions. The Muskoka Wharf is home to the RMS Segwun and the Wenonah II. These classic steamships offer a variety of tours around the Muskoka Lakes. The Muskoka Boating and Heritage Centre, an interactive museum that celebrates Gravenhurst’s rich steam ship and boat building heritage, is also located at the Wharf. The town of Bracebridge, Ontario is located about 15 kilometres north of Gravenhurst. It is situated on the Muskoka River; approximately 10 kilometres from beautiful Lake Muskoka. Founded in the 1800s, Bracebridge is the seat of the Muskoka District. Visitors to Bracebridge will find it a pretty little town, full of old time charm. Along its well preserved main street, you will find plenty of interesting shops, restaurants and visitors attractions. The town of Bracebridge has many parks, walking trails and scenic vistas, especially of the waterfalls and the Muskoka River that run through the heart of town. Bracebridge is home to many Ontario attractions. Santa’s Village, a Christmas theme park, is one of its most famous attractions. It has been delighting families on vacation for generations. While cottaging in Muskoka, be sure to find out about what’s happening locally. Bracebridge has many annual events and special happenings throughout the year, including fairs, fall festivals, arts shows, studio tours and car shows, to name just a few. For the history buff, Bracebridge has a number of historic buildings and historic sites of interest that are well worth viewing while on your Muskoka cottage country vacation. The Bird Mill Power Station, located on Wharf Road, was built in 1892 to supply Bracebridge with electricity. Bracebridge, Ontario became the first municipality in Canada to own and operate a hydro-electric generating station. The Bracebridge Public library on Manitoba Street has been serving Bracebridge for over 100 years. It was one of the famous Carnegie libraries; build with the help of a $10,000 grant in 1906 from American philanthropist Andrew Carnegie and is a reminder of the important role Carnegie played in public education in rural communities like Muskoka. Known locally as the "Bird Cage," the Woodchester Villa on King Street is one of the finest octagonal homes in Ontario. Built in 1882 by Henry Bird, the villa has been restored and is open to the public. The Village of Dorset, located on the beautiful Lake of Bays, straddles the districts of Muskoka and the Haliburton Highlands. It is a picturesque little town with a number of shops, restaurants, galleries and many interesting attractions. Dorset's main street is connected in the middle by a single lane bridge that crosses over the narrows of the Lake of Bays waterway which runs right through town. Throughout the summer months, Dorset is hopping with cottagers, sight- seers, area visitors, boaters, and sometimes the occasional black bear looking for a hand-out. While in Dorset, plan to visit their famous Dorset Observation Tower, as well as the Dorset Heritage Museum and the Bigwin Steamship Restoration Project. Another claim to fame, Dorset is home to Robinson’s General Store, a cottage country tourist attraction for generations that offers something for everyone. Voted "the Best Country Store in Canada," Robinson’s has an amazing selection of merchandise ranging from giftware, hardware, groceries, clothing and everything you need for your Ontario cottage vacation. Towering over the village for Dorset stands its famous lookout tower. Rising 82 feet, high atop a mountain, it has been a Lake of Bays landmark and a popular Muskoka tourist attraction for generations. Open from mid May through October, the view from the tower offers visitors a breathtaking vista of Muskoka’s eastern edge with its beautiful forests and lakes, including Lake of Bays and many small Haliburton and Muskoka Lakes. A fun outing for the entire family, try to fit in a visit to the Dorset tower during your Muskoka cottage rental vacation. The view is always spectacular, but especially from mid-September to mid-October, when the trees are ablaze with fall colour. The original Dorset fire tower, built in 1922, was part of a network of observation towers used to protect the area’s large stands of timber from forest fires. The tower immediately became valuable to the local economy as a tourist attraction, and in 1960, when technology eliminated the need for fire towers it was slated to be torn down. The community came together to build the replacement tower that stands today. Along with scenic trails, picnic areas and parking, an onsite kiosk sells t-shirts, sweatshirts and caps bearing the Dorset Tower logo. Another Dorset and Lake of Bays attraction that you may wish to visit during your summer cottage rental holiday in Muskoka is the Lake of Bays Marine Museum and the newly restored S.S. Bigwin, which is docked by the museum. The S.S. Bigwin is a century old steamship that was used during the first half of the nineteen-century to ferry guests to the exclusive Bigwin Inn on Lake of Bays, near Dorset. Today, you can relive history by taking one of the many scheduled cruises on this historic steamship for an informative tour of Lake of Bays, to see the sights of this very scenic lake and to learn more about the area’s history. The charming village of Port Carling, Ontario is a true Muskoka cottage town with much to offer Muskoka cottagers and summer tourists. Port Carling is known as the Hub of the Muskoka Lakes because of the staggering amount of boat traffic that flows through town. Situated on the Indian River joining Lake Muskoka to Lake Rosseau by way of a lock system, Port Carling is a Mecca for all types of watercraft. This vibrant little Muskoka tourist town has so much to offer and bustles with excitement, especially during July and August when cottagers and vacationers arrive in full force. Port Carling offers gift shops, boutiques, antique shops, art galleries, restaurants, lovely parkland and so much more. Watching the boats navigate the locks at the centre of town and the drawbridge that frequently rises to allow larger boats access is a favorite Port Carling past time. The Muskoka Lakes Museum is a popular Ontario cottage country attraction located in Port Carling. Open seasonally from Victoria Day until Thanksgiving, the Muskoka Lakes Museum showcases the history of the Muskoka Lakes, with emphasis on the area’s aboriginal peoples and early settlers. Focusing on the Muskoka Lakes lumber industry and boat building, the museum has many fine pioneer and marine displays that include an 1875 log cabin, old wooden boats, early gas engines and early native artifacts. A great place for families on a Muskoka vacation to explore and learn about the past, the Muskoka Lakes Museum offers permanent and seasonal exhibits, school programs, children’s summer activities and programs, adult workshops, informative lectures and many special events. Each month there is a new exhibit on display and a new art show is presented in the adjoining Catto Art Gallery. The town of Huntsville is a vibrant Ontario cottage country vacation destination that has much to offer with many exciting attractions, galleries, shops and special events. While in this charming resort town, visitors are sure to be impressed with the eye-catching Group of Seven Outdoor Gallery, an ambitious mural project located in various locations throughout downtown Huntsville. The mural project, in celebration of the contribution to the heritage of the Algonquin and Muskoka lakes region made by Tom Thomson and the Group of Seven, recreates some of these famous Canadian artists best loved paintings. A walking tour guide is available from the Huntsville Chamber of Commerce to assist visitors who wishing to see all the murals and learn more about them. Rich in history, Huntsville, Ontario has a proud pioneer heritage. Here, situated on a 90 acre site with a lake and nature trails, you will find the Muskoka Heritage Place, a popular Muskoka attraction that includes the Muskoka Museum, Muskoka Pioneer Village and the Portage Flyer Train. Close to Huntsville’s historic downtown, Muskoka Heritage Place features two museums, 18 authentic pioneer buildings, and an authentic open-aired train. The history of Muskoka is told through informative displays and costumed narrators demonstrating pioneer life in the 1800s. There is a gift and souvenir shop, and during the summer months, a snack bar. Site map translations are available in French, Japanese, Dutch and German for international visitors to Muskoka. Muskoka Heritage Place is open from Victoria Day weekend to Thanksgiving weekend. While on your vacation in cottage country, check out the great selection of live entertainment that is available throughout the year in Muskoka. Celebrating the performing arts, the Algonquin Theatre offers entertainment in Huntsville, Ontario year round. Located in downtown Huntsville, the Algonquin Theatre, in the Huntsville Civic Centre, hosts a wide variety of first-class plays, presentations and live musical performances by top international, national and local artists. Representing all musical genres, from classical to pop to country music, this large and modern theatre has hosted such famous entertainers as Blue Rodeo, John McDerrmot and Sarah Hammer. Visit the Algonquin Theatre website to see what entertainment is available during your holiday in Muskoka. The Huntsville area is home to many talented artists and crafts people. During your Muskoka vacation, you will discover dozens of different art galleries and artist studies that are open to the public. Many local artists invite visitors into their studios to shop and offer demonstrations on how the article is made. If you are interested in arts and crafts, the best time for year to book your Muskoka vacation is the fall when many of the Muskoka studio tours are in full swing. The Muskoka Fall Studio Tour, Canada’s oldest studio tour, takes place on either the last weekend of September or the first weekend in October. This self-guided tour is free. It takes participants on a scenic drive through the beautiful Muskoka countryside with its brilliant fall colours in full display with stops at the studios of award-winning artisans and artists. Algonquin Provincial Park is one of Canada’s best known and most visited tourist attractions. Located in central Ontario’s North Muskoka, Algonquin Park is right next door to some of the most popular Ontario cottage country areas, including Huntsville, Dwight and Lake of Bays. Ontario’s oldest provincial park, Algonquin is also one of Canada’s leading eco-tourist destinations. Comprised of 7,725 square kilometres of forest wilderness, wildlife abounds in Algonquin Park, where thousands of species of animals and plant life thrive in this protected sanctuary, including large populations of deer, moose, wolves and bear. Within the Park, visitors will find thousands of kilometres of walking, biking and hiking trails, canoe routes, camp grounds, picnic areas and several park attractions, like the Visitors Centre, the Logging Museum and the Art Centre. A visit to Algonquin Park makes a wonderful day trip for both families and couples enjoying a cottage vacation rental in Muskoka, Huntsville, Haliburton, Dorset, Bracebridge or Dwight. There is something of interest for every member of the family. As well as touring the Algonquin Park Logging Museum, Visitors and Art Centres, other activities include mountain biking, horseback riding, canoeing, hiking and cross country skiing. The Park has nineteen interpretive trails, varying in length from less than a kilometre to approximately thirteen kilometres. Every trail has its own trail guide to educate visitors about the Park’s many different historical and ecological features. So take some time during your Ontario cottage rental vacation and visit a great Canadian landmark that is also a National Historic Site of Canada. The North Muskoka town of Rosseau, located on the northern shore of Lake Rosseau, in Parry Sound district, has been welcoming tourist for over one hundred years. This pretty little place has lots going for it and is worth a visit. Rosseau has interesting shops, restaurants, a marina, a popular public beach, and the landmark Rosseau General Store. This white wood-framed two-story general store looks today very much as it did when it first opened in 1875, with original wooden floors and interior displays. The store sells a wide variety of goods including groceries, hardware, clothing and giftware. Shopping there is like taking a journey back in time. During the summer months, Rosseau’s scenic waterfront hosts a large farmer’s market every Friday with many participating vendors, as well as live entertainment. If you are in the area in late August, be sure to attend Rosseau’s annual Fall Fair. Recognized as the Cranberry Capital of Ontario, the quaint little Muskoka town of Bala is best known for its annual Bala Cranberry Festival and for the famous live summer entertainment venue, The Kee. Bala is scenically situated at Bala Falls, where Lake Muskoka meets the Moon River. Bala has a long history of welcoming cottagers and tourists to the Muskoka Lakes Region. For more than a century, the town has functioned as major cottage country hub, starting from as far back as the late eighteen hundreds when tourist arrived by train to catch a steam ship, such as the R.M.S. Segwun, the Islander and the Cherokee, at the Bala Government Wharf, and continue on their journey to nearby lodges, resorts and private cottages on Lake Muskoka and beyond. The Bala Cranberry Festival is held annually on the weekend following Thanksgiving. This popular Muskoka event draws visitors from far and wide, and offers something for everyone, including live concerts, arts and crafts vendors, midway food courts, petting zoo, demonstrations and displays, fireworks, and a whole lot more. Bala’s other major attraction, The Key to Bala, is a popular Muskoka concert venue that features world-class entertainers and major bands like Rush, Kim Mitchell, and the Tragically Hip. The Key was originally known as Dunn’s Pavilion. Built in the 1940s by Bala businessman Gerry Dunn and was the grandest music pavilion in cottage country. In its hay-day, Dunn’s Pavilion drew huge crowds to Muskoka, to hear musical greats like Louis Armstrong, The Dorsey Brothers, Count Basie and The Glen Miller Orchestra, and dance the night away in their finest attire. The Ontario cottage country town of Bala has one other claim to fame. Acclaimed Canadian writer Lucy Maud Montgomery, who penned the famous P.E.I. based Anne of Green Gables novels, also wrote a book that was set in the Bala, Ontario area. Montgomery vacationed in Bala in 1922 and was so taken with its charms she used Bala and the district of Muskoka as the setting for her book The Blue Castle. The former tourist home where Montgomery dined during her Muskoka vacation has been restored to look as it did in 1922 and is now the home of the Bala Museum. Open to the public, the Bala Museum features L M Montgomery historic memorabilia, an Anne of Green Gables gift shop and book store, and a wealth of exciting events for the entire family. The sleepy little Muskoka village of Baysville, Ontario is located on the Muskoka River at the south end of the Lake of Bays. It’s just a 20 minute drive from both Dorset and Bracebridge. Like so many old Muskoka towns, Baysville started out in the late 1800’s as a mill town. After the area had been logged out, tourism took over as the chief local employer, with fancy large tourist hotels, like the Bigwin Inn, the Britannia and the Wawa, as well as smaller tourist establishments, like the Idlywyld Lodge, Baysville House and Burlmarie Hotel playing host to summer vacationers who arrived by steamship, after a train ride north from Toronto and the northern States. Today, Baysville plays homage to its past by preserving its heritage sites and building of historic interest. While in Baysville, visitors can enjoy the lovely garden’s along the historic riverfront and take part in events like free concerts, a farmers market, festivals and the Lake of Bays Antique and Classic Car and Boat show. A small cottage country community located on Lake Rosseau, the village of Port Sandfield played an important role in the development of Muskoka. Named after the then premier of Ontario; John Sandfield MacDonald, Port Sandfield, was founded in 1870 when a canal was built to join Lake Joseph with Lake Rosseau. This was at the same time that the lock at Port Carling was completed. The lock and canal were built to enable steamships to travel Muskoka’s three largest lakes; Lake Muskoka, Lake Rosseau and Lake Joseph, carrying tourists, freight, mail, and lumber. Over time, Port Sandfield’s lock fell into disrepair, until several years ago when it was restored. Today, along with the lock and historic old swing bridge, visitors to Port Sandfield can explore the village’s gift shops, general store, bakery and marina. The village of Dwight, at the crossroads of Highway 60 and Highway 35, is a small community on the shore of Lake of Bays where the Oxtongue River connects with Oxtongue Lake. Approximately 250 kilometres north of Toronto, Dwight is sometimes known as the gateway to Algonquin Park, as the western most boundary of the Park’s is just 15 minutes away, making a rental cottage in Dwight an ideal location for taking day trips into the Park. In and around Dwight, visitors will find several restaurants and specialty shops like the Oxtongue Craft Cabin and Gallery. Ragged Falls is a popular local attraction that is well worth a visit to walk the marked trails and view the spectacular waterfalls. For even more things to do while on vacation at a cottage in Dwight, the town of Huntsville with its many shops, restaurants and attractions is only 20 minutes away. Vacation Time Real Estate is a leader in lakeside cottage and vacation home rental accommodations. We have a fine selection of cottages for rent and cottages for sale in and around the Ontario cottage country communities of Rosseau, Dorset, Port Carling, Algonquin, Bala, Gravenhurst, Port Sandfield, Muskoka River, Lake of Bays, Bracebridge, Huntsville, Dwight, Mactier, Windermere, Minett, Ufford, Utterson and Torrence. Each of these popular Muskoka Ontario vacation destinations is unique and offers visitors a wide range of things to see and do while on their cottage rental holiday. 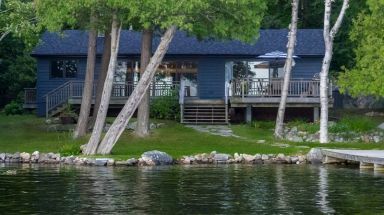 While a majority of cottage rental inquiries received by Vacation Time Real Estate are for summer cottage rentals for weeks during the busy months of June, July, August and September, we also handle requests for Ontario cottages for rent throughout the rest of the year as well. We have many wonderful four-season cottage properties that are available for rent year-round, including weekly winter cottage rentals, spring cottage rentals and fall cottage rentals. There are also a number of Muskoka rental properties that offer seasonal cottage rentals for long-term stays. Vacation Time Real Estate is an experienced Muskoka real estate rental company, as well as a respected Muskoka real estate brokerage firm. When you entrust Vacation Time to manage the rental of your cottage property, you can feel confident that we will handle every aspect of the job efficiently and professionally, and make the entire process hassle-free. We take care of every aspect of your vacation property rental, including advertising the property, answering phone inquiries and screening potential renters. After we have found the right renter for your cottage; we will handle all the necessary paper work, including obtaining a signed rental contract and collecting security deposits and rent. We make arrangements for keys and take care of returning security deposits. We are well established in Muskoka and have developed relationships with many of the trades and business people here in cottage country. If, by chance, something should go wrong with your rental property; a pipe break, a refrigerator stops working pipes, and it needs to be fixed without delay, we can act as a liaison between you as the rental cottage owner and a qualified service person. This is especially important if your vacation rental property is located hours away and you don’t have the time to spend driving up to fix things yourself. When you hire a professional real estate rental company, like Vacation Time Real Estate, renting your Ontario vacation home couldn’t be any easier. Our Ontario cottage rental company lists only privately owned waterfront cottages or timeshare condo properties in cottage country. All of our vacation property listings are suitable for couples and small family groups. Unfortunately, our vacation properties do not accommodate large groups or group functions, weddings or family reunions. The maximum number of guests allowed in a cottage is clearly stated on each cottage rental listing. At times, upon request, larger groups may be accommodated with the prior consent from the vacation property owner. Adhering to strict occupancy rules ensures that all of our vacation rentals received minimal wear and tear and are kept in top condition for the enjoyment of renters and cottage owners. Over the many years that we have been in the Muskoka cottage rental business, Vacation Time Real Estate has listed several hundred Muskoka cottages for rent and successfully secured and managed the rental of thousands of weeks of cottage rental vacations in Ontario cottage country. We have built a large inventory of vacation properties for rent and have many repeat rental customers who have been happy with their cottage vacation in Muskoka. We are successful because we are honest, hardworking and dedicated to delivering to our customers, both the cottage owner and the cottage renter, outstanding service and a very successful, problem-free rental. When you select a rental cottage listed with Vacation Time Real Estate for your cottage country vacation in Muskoka, you can rest assured that you and your family will not be disappointed with the quality of your rental vacation home. We thoroughly inspect every cottage before accepting it into our extensive inventory of cottages for rent. Only the cottages that meet our high standards are accepted. We want our clients to find the Muskoka rental cottage that best suits their needs. The Vacation Time Real Estate site is easy to maneuver and contains a wealth of information and photographs of all cottage properties offered. We are available to answer any questions that you might have and are always pleased to provide our recommendations to match you with the ideal cottage rental. Not only is Vacation Time Real Estate a top Muskoka cottage rental agency, we are also experienced real estate professionals, selling Muskoka real estate. Our full service real estate brokerage offers a wide selection of Muskoka properties for sale, both residential and commercial properties, including executive waterfront homes, family cottages, condominium apartments and fractional ownership condos. If you are in the market to buy a Muskoka cottage or waterfront home on Lake Joseph, Lake Rosseau, Lake Muskoka or one of Muskoka’s many beautiful smaller lakes, we would be happy to assist you. We are long established Muskoka realtors and we have the expertise to steer you in the right direction. At Vacation Time Real Estate, we are a team of experienced Muskoka real estate professionals with decades of combined experience helping our clients buy and sell Muskoka cottages and waterfront homes. As a full service Muskoka real estate brokerage firm, we have a proven track record successfully marketing and selling all types of waterfront, residential, commercial and condo/fractional ownership properties for sale. If you are considering listing your Muskoka property for sale, we are happy to provide a complimentary home evaluation and offer tips on how to make your home or lakefront cottage more saleable in today’s real estate market. Whether you hire us to sell your Muskoka cottage or to rent your waterfront vacation home, you can be assured that we will work hard on your behalf to produce results. Our goal when working with property owners is to make their property sale or cottage rental experience with us convenient, worry-free, and successful. We are licensed Muskoka real estate agents with years of experience selling Muskoka properties and handling Muskoka cottage rentals. Vacation Time Real Estate has helped thousands of clients sell and rent in Muskoka. We know how to market your property effectively and can advise you how to prepare your cottage to make it look its best to prospective buyers and renters. Vacation Time Real Estate specializes in Muskoka cottage and vacation home rentals. Muskoka, Ontario is one of the most picturesque and desirable vacation areas in the world, according to National Geographic Traveler Magazine. World-renowned, the Muskoka Lakes is Ontario’s favorite summer vacation destination, especially for people living in the GTA, southern Ontario and the northern states. The most desirable time to vacation in Muskoka is during the summer months of July and August, so it is important to book well in advance for the greatest selection of rental properties available. When booking you next vacation in cottage country, be sure to check out our many great cottage rental listings. Let us help you find the perfect Muskoka rental cottage so that you and your family can enjoy a memorable Muskoka vacation. Whether listing your Muskoka vacation home for rent or listing your Muskoka cottage for sale, you can be assured that with Vacation Time Real Estate Inc, you are entrusting your Muskoka property to professionals. As a licensed Ontario Real Estate Brokerage, not only are we accountable to our valued clients, but to the Real Estate Council of Ontario. As licensed realtors, we adhere to the Canadian Real Estate Association’s Code of Ethics and Standards of Business Practices. This Muskoka cottage rental agency and real estate office are also members of the following professional organizations, including the Canadian Real Estate Association, The Ontario Real Estate Association, the Muskoka Real Estate Board, and the Muskoka Lakes Association. As well, we are members of the Bracebridge, Gravenhurst, Huntsville, Lake of Bays and West Muskoka Chambers of Commerce. Think you would like spend your summer vacation relaxing at a beautiful Muskoka lakefront cottage this summer? You don’t have to be rich to experience the pleasures of a Muskoka cottage vacation. Call Vacation Time Real Estate to find the ideal Muskoka Ontario cottage rental to suit your needs and budget. We are one of Muskoka’s leading lakeside cottage and vacation home rental accommodations companies, with an extensive inventory of the best inspected rental cottages in Muskoka, Lake of Bays Port Carling, Gravenhurst, Huntsville, Bracebridge, Dwight, Bala and Minett. You will be pleased to discover that you and your family can afford to vacation in Muskoka. An affordable Muskoka cottage vacation is just a click away with Vacation Time Real Estate. We offer a wide selection of inspected rental cottages in all price ranges, from large and luxurious executive cottages to less expensive rental cottage options. Muskoka may be known for its many celebrity cottage owners like Steven Spielberg, Tom Hanks, Goldie Hawn, Kurt Russell, Bill Murray and dozens of NHL and other sports stars, but most cottages in Muskoka are owned by average Canadians. And, while the north end of Lake Joseph with its multi-million dollar cottage mansions may be called Billionaires Row for a reason, there are many perfectly lovely, more modest cottages in Muskoka. At Vacation Time Real Estate Muskoka we represent privately-owned cottages, waterfront vacation properties and timeshare units for rent in Muskoka. All of our cottage rental listings are suitable for vacation rentals by individuals, couples or small family groups only and are not suitable for large groups, weddings, reunions or any other type of large group function. Maintaining a strict rental occupancy policy benefits both the cottage renter and the rental cottage owner. Restricted occupancy numbers reduces wear and tear on the cottage, its furnishing, equipment and septic system. Renowned for its magnificent scenery and beautiful lakefront cottages, Muskoka is Canada’s favorite and best loved Ontario cottage country destination. Renting a cottage in Muskoka is a great way to enjoy all the benefits of cottage ownership without the expense and upkeep of owning a cottage. Renting a Muskoka cottage with the help of Vacation Time Real Estate Muskoka, makes finding and renting the perfect vacation home for you and your family is a snap. Shop our online inventory of inspected cottages for rent, or you can call or email our Muskoka real estate office located in Gravenhurst, to help in your search or to answer any questions you might have. Our Muskoka cottage rental team members are longtime Muskoka residents with in-depth knowledge of this fabulous cottage country vacation destination. Whether you are looking to rent a cottage, or you would like to make some rental income from your Muskoka vacation home, with our many years of experience in the Muskoka real estate and cottage rental market, we can successfully guide through the cottage rental process. The District of Muskoka is a regional municipality in Southern Ontario that is comprised of several areas, including the township of Muskoka Lakes, Georgian Bay Township, and the towns of Bracebridge, Gravenhurst, Huntsville, and Lake of Bays. Approximately 60,000 residents have their year-round home in the Muskoka area. An additional 100,000 more are seasonal Muskoka property owners. In addition, Muskoka receives over a million visitors each year, including people on daytrips, and vacationers staying with family and friends, or at Muskoka resorts, and Muskoka cottage rental properties. Muskoka is part of the Canadian Shield. Its rocky terrain, rich in mineral deposits, contains rock that has been dated by scientists to be as much as 1.5 billion years old. Amongst the many large, and iconically Muskokan, granite outcroppings, grow forests of white birch, balsam, jack pine, popular, tamarack and spruce. But what makes Muskoka such a beloved place and coveted Ontario cottage and vacation Mecca, is its more than 1,600 scenic lakes and pristine natural beauty. Although the first reference to the place we now know as Muskoka was recorded in 1615, the area had been home to Canada’s first peoples for millennia. When Champlain, the first explorers and missionaries came to the area they were greeted by members of the Huron and Algonquin tribes. Except for trappers, missionaries and explorers, there were few settlements established until the second half of the 18th century. The area’s rugged landscape of trees, rocks and lakes, which have made Muskoka such a desirable vacation destination, proved unsuitable for farming and did little to attract settlers. In the second half of the nineteenth century, the Government of Upper Canada started to explore and map the Muskoka area. The construction of rudimentary roads began and the first logging licenses were issued. In 1868, the Free Land Grant and Homestead Act was implemented to attract European immigrants to Canada and boost settlement. Up to 200 acres of land was given to each settler who built a house, cleared fifteen acres of land and lived on the property for at least for five years. The government however, retained all mineral and logging rights to the land. Muskoka experienced a large influx of immigrants from Europe during this period, due to the government’s offer of free land, especially from Ireland where people came to Ontario to build a new life and escape the Potato Famine. Increased settlement, coupled with the rapid growth of the logging industry, brought with it improved land-based transportation routes throughout the region, with new roads built and railways expanded to Gravenhurst and Bracebridge. Due to huge market for lumber in Great Britain, logging quickly became the most important industry in Muskoka, New settlements sprung up throughout the region of men and their families who worked in logging camps and sawmills, and businesses who served the industry. Meanwhile, the immigrants from Europe who had taken up the government’s offer of free Muskoka land were having a hard time. If clearing 15 acres of heavily wooded and rocky land for cultivation was difficult, trying to eke-out a living growing crops in Muskoka’s hard-packed clay soil, proved nearly impossible. Many abandoned farming and went to work in the rapidly growing lumber industry, on steam ships, in leather tanning businesses, or wherever they could find work. During Muskoka’s early days before railway expansion, steamships were vital to the growth of its lumber industry. Later, when the logging industry began to wane as area forests became depleted, Muskoka steamships continued to be an important means of transportation. They would also play a significant role in the development of Muskoka’s next biggest industry: tourism. The earliest known Muskoka tourists were thought to be James Bain Jr. and John Campbell, who, in the 1860, travelled by train, steam ship, canoe, and by foot to Gravenhurst for a holiday. Drawn by the beautiful scenery, great fishing, fresh air, and absence of ragweed, they continued to make the trip each summer, raving to friends and relatives of Muskoka’s many virtues as a holiday destination. As word spread over the years, more and more people made the long trip to vacation in Muskoka. It didn’t take long after those first tourists arrived that there arose a demand for better accommodations and improved transportation to get to Muskoka. Local farmers, who could barely earn a living farming the land, opened their homes to tourists. As the demand for rooms grew, many converted their properties into boarding houses and inns, and the Muskoka tourist industry was born. Rosseau House on Lake Rosseau was the first wilderness hotel built in the area, with others quickly following. The Muskoka steamship era saw the construction of several grand hotels, including the Royal Muskoka Hotel, Clevelands House, Beaumaris Hotel, and Windermere House, to name a few. Vacationers would travel from Toronto and locations in the northern states by rail to Gravenhurst. Here they would board a Muskoka Lakes Navigation Company Steamship to continue their journey by water, stopping at ports like Port Carling, Beaumaris, and Bracebridge, or transferring once again to smaller vessels in order to reach their final destination. By the 1910’s, there were more than 70 resorts, inns, and lodges in Muskoka. Several of the Muskoka accommodation properties that got their start in the early days of its tourist boom are still in business today. Places like Windermere, Grandview, Clevelands House, Severn Lodge, Port Cunnington, to name a few, are familiar landmarks dotting the region’s shorelines.With the great Muskoka tourist boom, the fortunes of the towns of Gravenhurst, Bracebridge, and Huntsville began to depend more and more on the tourist trade. The fur trade had virtually disappeared and the lumber industry was winding down, so the timing couldn’t have better as Muskoka’s growing tourism industry brought employment and increased prosperity to the area. Since getting to cottage country from southern Ontario and the northern states in the early days of Muskoka tourism took a full day or more, vacationers usually stayed for several weeks or even the entire summer. Keeping these ever-increasing numbers of new summertime residents lodged, fed, and entertained, provided countless jobs for Muskoka’s year-round residents and spurred many new service and hospitality related businesses. As the years went by, more tourist accommodations in Muskoka were built to handle the demand. At the same time, some of the families that had fallen in love with the area while spending their summers vacationing at Muskoka lodges and resorts wanted to make their tie to the area more permanent by establishing their own summer residences in Muskoka. While many of the early Muskoka cottages were simple and rustic, it wasn’t long before wealthy families started to buy-up prime Muskoka waterfront real estate and build palatial vacation homes. As the years passed, Muskoka cottage owners became less reliant on trains and steamships to get to their cottage properties. People, especially the well-to-do, had automobiles. Although in the early days of car travel, the roads to Muskoka were poor to say the least. Once in cottage country, many cottagers now had motorboats to take them the final leg of their journey to water-access vacation homes. Some of these boats were large and quite valuable. Wooden boats made by companies like Greavette, Ditchburn, StanCraft, and Shepherd, today synonymous with Muskoka, offered cottagers with both independent transportation and recreation. To protect and store their watercraft, boathouses began to spring up along Muskoka shorelines. In some cases, large and elaborate structures were built, and the iconic Muskoka boathouse was born. Muskoka tourism took a nose dive with the start of World War I. Fewer people vacationed in Muskoka or built cottages during the war years and through the great depression of the 30s. When the economy improved and more people could afford to buy a family car, the resulting demand for paved roads accelerated development in Muskoka and improved transportation to the area, opening up access to more lakes for cottage development. About this time, the demand for steamship transportation started to wane. After World War II, postwar prosperity allowed middle class families to buy into cottage ownership. Owning a cottage in Muskoka was no longer just for the well-to-do, as more and more people wanted their own slice of paradise on a Muskoka lake. By now, most Muskoka cottagers drove to the cottage in the family car or, if they had a water-access cottage, arrived in their own fiberglass boat. The last Muskoka steamship on a delivery route retired in the late 1950s, ending an era. The last half of the twentieth century witnessed an ever increasing number of cottages being built in Muskoka. It seemed like everyone wanted to vacation in Muskoka. For those who didn’t want the upkeep or investment of cottage ownership or could not afford to own a private Muskoka cottage but still wanted to enjoy a Muskoka cottage vacation, many turned to private cottage rentals and small cottage resort accommodation properties.Over the last several decades, many of the original modest and rustic family cottages built on large lakefront lots during the first half of the twentieth-century have been updated, extensively renovated, or entirely replaced with large lakefront homes and luxury cottages.This is especially apparent on the Big Three Lakes (Lake Joseph, Lake Rosseau, and Lake Muskoka), where many new multi-million dollar vacation homes dot the shore lines, alongside the beautiful original century-old summer residences that remain as charming as they were the day they were built. One of the most scenic vacation areas in the world, today Muskoka is regarded Ontario’s best place to vacation. The Muskoka area has been recognized by National Geographic Traveler as an international destination and their pick as one of the top ten summer vacation destinations in the world for those looking for an “out-of-the-ordinary summer vacation. While Muskoka may have developed somewhat of a reputation as Ontario’s playground for the rich and famous, anyone can enjoy a reasonably priced Muskoka vacation. By using the services of a professional cottage rental agency like Vacation Time Real Estate, renting a private cottage in Muskoka can be convenient, hassle-free and affordable. Whether you wish to rent for a week, two weeks, or even a month, Vacation Time Real Estate has an extensive inventory of inspected Muskoka rental cottages, in all price ranges. Our Muskoka cottage rental company has been renting cottage for many years. We serve the Muskoka Lakes, Huntsville, Bracebridge, Gravenhurst, and Lake of Bays areas. Our inventory of Muskoka vacation homes for rent includes properties on some of the area’s most popular lakes, like Lake Joseph, lake Muskoka, Lake Rosseau, Peninsula Lake, Sparrow Lake, Gull Lake, Kahshe Lake, and many more. As well, Vacation Time Real Estate has many wonderful cottages for rent on some of the smaller Muskoka lakes and on scenic Muskoka rivers, like Moon River, the Muskoka River, and the Severn River. For several generations, Muskoka has been regarded as Canada’s quintessential cottage country destination. This is prime Ontario's cottage country and Muskoka’s popularity just keeps growing. With its awe-inspiring landscape, profusion of clean lakes, all within a short drive from the Ontario Golden Horseshoe and the northern states, little wonder that it is the favorite vacation destination in Ontario. Muskoka is just two hours north of Metropolitan Toronto, via major highways, Highway 400 and Highway 11. Spread over 6,475 sq. kilometres, Muskoka reaches from Georgian Bay to the western border of Algonquin Provincial Park, and down to Lake Couchiching in the south.